Cone Beam CT Imaging. What's better than an x-ray of your teeth? An on-screen, movable 3-D representation of your jaws! By taking a series of x-ray “slices” and stitching the images together with a powerful computer program, Cone Beam CT imaging creates a virtual model of your mouth. It can be used to find disease, plan procedures, and visualize internal structures that formerly wouldn't have been visible without surgery. Using images obtained with the 3D scanner, more precise treatment planning can be accomplished, particularly with dental implants. While Cone Beam CT is not quite the same as a medical CT, the dental cone beam can provide images similar to the medical CT, but with far less radiation. The Cone Beam CT can be used for cases such as: Planning for removal of impacted wisdom teeth, accurately placing dental implants, evaluation of the jaws for tumors or other abnormalities, evaluating the sinus cavities, and as an aid in diagnosing temporomandibular joint disorders. 3D printed implant surgical guides. Accurate placement of dental implants is important, particularly when multiple or front teeth are to be replaced. Using the 3D Cone Beam Scan technology, the positions of the implants to be placed are determined virtually in the scan. 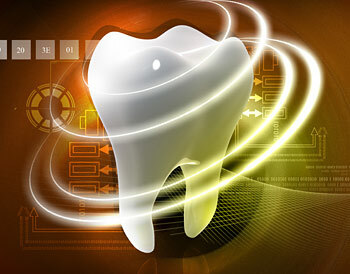 That information is uploaded to a dental laboratory that will interpret the scan information and then print a surgical guide that accurately reproduces the planned implant positions. The guide is then used during surgery to locate the proper position in the jaw for implant placement.